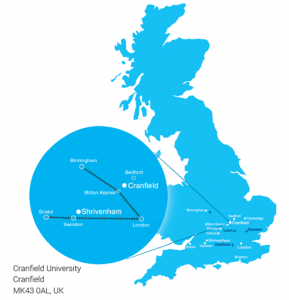 Cranfield is an exclusively postgraduate university that is a global leader for transformational research in technology. Cranfield is focussed on the specialist themes of aerospace, defence and security, energy and power, environment and agrifood, manufacturing, transport systems, and water. Cranfield has the largest number of engineering and technology postgraduates in the UK, awards over five percent of the UK’s engineering and technology PhDs each year and currently works with over 1,500 companies and organisations worldwide. Cranfield is ranked in the top five of UK universities for commercial research income, with 81% of Cranfield’s research classed as world-leading or internationally excellent by REF (Research Excellence Framework, 2014). Cranfield University was formed in 1946 as the College of Aeronautics, the first postgraduate college of its kind. Engineering Photonics at Cranfield is recognised internationally as a leading centre for optical sensing and instrumentation, which, since its inception in 1989, has been led by Professor Ralph Tatam. Engineering Photonics undertakes research ranging from blue skies concepts to the development of prototype instrumentation that is used by us and our academic and industrial collaborators in real environments. Engineering Photonics applies advanced photonic technologies to solve challenging measurement problems. Our research underpins measurements across a wide range of industrially important areas such as: aerospace, healthcare, manufacturing, transport, automotive, environment and agrifoods. We work in collaboration with academia, SMEs and major international companies both nationally and internationally. Optical interferometry; optical fibre sensor technology including interferometry, FBGs and LPGs; optical imaging and image processing; optical gas sensing; speckle interferometry and metrology.